Really pleased that this episode seemed to fix/ add a few things that was making the show suffer. I highlight the fact that Hobbes is onto Ryan, which can surely mean Ryan's death is a certainty, either by the hands of Hobbes or Anna. Secondly - THANK GOD THEY HAVE MADE TYLER STOP WORKING WITH THE Vs!!! Maybe now his character will take more of a back seat. And does anyone think Tyler's dad is a V? DHARMAham wrote: THANK GOD THEY HAVE MADE TYLER STOP WORKING WITH THE Vs!!! I doubt he's really stopping. DHARMAham wrote: And does anyone think Tyler's dad is a V? Hm I don't think so. Good episode, I hope Marcus dies, although I always liked him. Great turn of events that Ryan is the enemy now, loved Hobbes look at the end. They should skin Ryan, I really dont like his story. Tyler, did he actually grow a few braincells? Ana and her quest for the soul...its getting tiresome. Her dialoge is also getting lamer, which is too bad, because she was always one of my favourites. The new journalist, great way for Chad to get an anti V opinion on the telly without him being the one to voice it. I dont want Marcus to die, but for story purposes it would be good. I really enjoyed this episode, really suspenseful. Now they only need to give Tyler less screentime and I am happy. "pretend we don't know each other ok father cos we're about to be questioned, (again)" "ok Erica"
How lame this show has become and to think season 1 was brilliant it is really sad. Oh well , what is it now 5 episodes to go till it's cancelled ? did anyone watch the season finale of human Target last night ? there's another show that had a MINT first season and then partially ruined in season 2 I wonder if there will be a season 3 ? UGG if so bring back the original writers please. I love the episode. I think there's something odd about Tyler's dad, but I don't think he's a V. Maybe is just his attitude, the fact that he takes the news about Tyler so well, I don't know, I'm beginning to think that maybe he already knew. 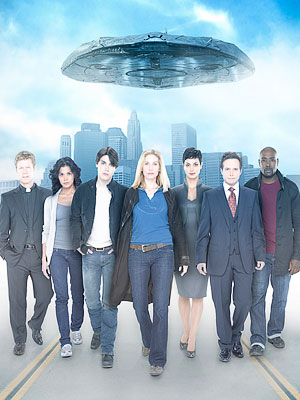 V is one of my favorite SCi fi television flicka and its really gaining popularity these days . Morena Baccarin and Lourdes Benedicto performance is just great and i love to watch this. I want to like this show, but the dialogue is starting to get more and more irritating. This is another show that started off with a great premise and good actors, but just isn't all that good. Also, the pacing seems a bit off as there isn't much that really happens on this show - everything drags out for much of the season, with most of the sub-plots not meaning much. This show is getting worse and worse as the weeks go on and I think I'm very nearly done with it. Ricardus Alpert wrote: I want to like this show, but the dialogue is starting to get more and more irritating. I agree with you somewhat, the Anna dialogue is getting lamer by the episode. She doesnt have to explain all her evil plans to the audience every second. We get, they want to destroy us and create uber alien human hybrids. You're right. Now that you say it she isn't half as scary as she was in s1 anymore. Hopefully the showdown with her mother will be good. Ricardus Alpert wrote: I want to like this show, but the dialogue is starting to get more and more irritating. This is another show that started off with a great premise and good actors, but just isn't all that good. Also, the pacing seems a bit off as there isn't much that really happens on this show - everything drags out for much of the season, with most of the sub-plots not meaning much. This show is getting worse and worse as the weeks go on and I think I'm very nearly done with it. As for the Anna thing, I agree on that. She turned into a much weaker character this season, but I don't mind so much, I prefer that the badass part goes to Erica But yeah, she is aways explaining how evil her plans are, without actually revealing anything. I agree with that! I wouldn't totally disagree with you on that point beresford - I have been gone from this forum for a very long time, so this was almost my reaction to the show as a whole as much as just the past episode. While I enjoyed this episode more than others, I just feel like all the faults that I find in the show were still there - though not as much.